Grandma Theresa’s heart is extremely weak. No surprise, as it’s been pumping nonstop since before she was born in July of 1912. That’s the year the Titanic sank. We visited Grandma yesterday in her room at the assisted care facility. At the age of 103, she’s not even in a nursing home. Since earlier this month, she’s technically under hospice care, but little has changed in her already quiet, simple days. When we arrived, she was standing at her dresser, brushing her hair. Other cousins had arrived just before we did. Grandma explained that when they had knocked on her door, “I was just lying in bed doing nothing. Thinking.” So she got out of bed and tidied herself up. She can still hoist herself out of bed with only the help of a walker. Was this an accurate memory? Indeed it was. In a few moments, Uncle Andy himself arrived and confirmed the whole story. He was amazed to see how well his mom looked today. More people soon arrived and we all enjoyed a lively conversation. Grandma—this is my husband’s mother’s mother—has a history of bouncing back. She survived breast cancer in her 60s. She survived colon cancer at age 98. No one can count how many times she has seemed “near the end” and then, in a day or two, emerged again as her cheerful self, able to enjoy a joke and even tease a little in return. And that’s how she was yesterday. What is her secret? Well, she is by far the most saintly person I know. She spent decades in India and Nigeria as a missionary nurse with her doctor husband. She has been a lifelong, faithful Christian. What she loves more than anything is to sing hymns with the family. And if no one’s around, she’ll just hum them to herself. But her faithful life of Christian service is not what makes her a saint to me. It’s her spirit. In her presence, I sense what absolute contentment might feel like. She lives in the moment, expresses gratitude for small things, appreciates what comes without dwelling on what’s lacking. Trusts that the world has order and beauty to it without agonizing much when it can’t be perceived. This is not new. She has always been this way. But as the days linger and her world contracts, even as her eyes, her hearing, her body weakens, on the very threshold of the world to come—it’s clear she has found the place we’re all striving for. How do I find that place? Grandma would never admit to being anything special. A few weeks ago, in fact, during another visit, she remarked that she didn’t feel she had done anything special with her life. This was not a comment out of bitterness or regret; it was just humility. My husband and I laughed. Did she not know that her beautiful spirit was its own special achievement? Is it a result of wise perspective, gained from living through so many upheavals of history? Her first child was born during World War II, on a stopover in Burma during an ocean voyage to India, during which they had to travel blackout for protection. Refugees are nothing new to her. She and her husband were on the scene during the Partition of India and Pakistan in 1947. She saw the Korean War, Cold War, Civil Rights, oil crisis, economic ebbs and flows. When she was born, no one had a telephone. Yesterday we used FaceTime on an iphone so that her daughter, my mother-in-law, could join the conversation from Arizona. Or maybe her grateful spirit is hard-won, from walking her own dark valleys? Her first husband, the missionary doctor, died in 1986 after a long, miserable, degenerative illness. Then she watched her daughter Judy weaken from MS until Judy died in 1996, leaving a grieving husband and four young children behind. Grandma’s heart has been wounded by the mystery of suffering. I suppose it’s no wonder it’s weak. But it keeps beating. 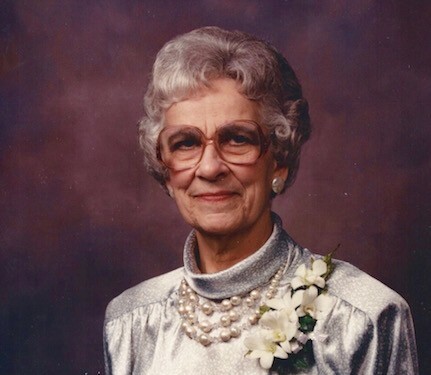 After being a widow for ten years, Grandma surprised everyone, most of all herself, by giving in to the romantic overtures of a man two years her junior (age 81 to her 83) and marrying again in 1995. She enjoyed eleven happy years with her second husband until he died in 2006. His death was disorienting and hard, but she lived on. One of my sweetest memories of Grandma is her visit after the birth of my daughter, Miriam, in 1993. Miriam was Grandma’s very first great-grandchild. We were living in Iowa at the time, so my mother-in-law and Grandma traveled from Michigan when baby was only a week old, and they stayed a week to help out. It was wonderful to see how much Grandma delighted in this little baby, this new generation. Having specialized in pediatric nursing, Grandma knew her way around babies. We heard interesting stories about mothers and babies at the mission hospitals. And I remember one beautiful moment when Grandma expertly bathed my newborn daughter under a sunny window, right in the kitchen sink. Even among the pious, saintliness in old age is not guaranteed. As we age, our inhibitions atrophy. Whatever ingredients gather in the dregs at the barrel-bottom of our souls: that’s what everyone will see. A critical spirit? Judgmentalism? Self-pity? Manipulation? You won’t be able to hide it. So start now. Start purging yourself of that stuff right now. You may not get as many years as Grandma has had for your sanctification project. Then again, maybe Grandma is not some kind of sanctification achievement. Maybe for her, it was all a gift. She was gifted by the Spirit with a contented spirit. An abundant supply of serotonin. I don’t know how it works. I do know that I want to be like her. I want to find that place of contentment on the threshold of the world to come. I want to start now. Here’s some order and beauty that I can perceive: that daughter born in 1993 is today a college graduate, married and preparing to start medical school next fall. She is working this year in the very facility where Grandma lives. Miriam tells stories of elderly residents who are gentle and sweet, like Grandma, and of others who—in their weakness and fear—lash out at the aids, complain, demand, resist. Miriam can handle anything, though. My tiny baby has grown into an amazingly capable and compassionate young woman. One day, just a couple weeks after she started the job, Miriam had to learn how to give a resident a bath. One of the first residents she had to bathe was Great-Grandma Theresa. Beautiful. I enjoyed reading this! Wow, Powerful! Really made me think hard about life and thankfulness and blessings! I felt so blessed to be surrounded yesterday by such an amazing family! We are lucky to have experienced what Grandma has gifted to us. Everything she is, was and will be to us and our/her offspring. Thank you Deb for this reflection. Loved reading this Marty. It woke up my own contentment that is now comforting my own soul during difficult times. Such peace gives strength to weather, persevere and hope. Bless you! I think you captured it Deb, thanks.